If you are accepted as an Authorized Dealer, you will make 10% on every sale you make, including Self Purchases, and others that become Dealers. Simply Register and pay a One-Time Fee of $239.00 with your application. As an Authorized Dealer, ALL SALES you process and ALL OTHER SALES that identify you as the referral will earn you 10%. 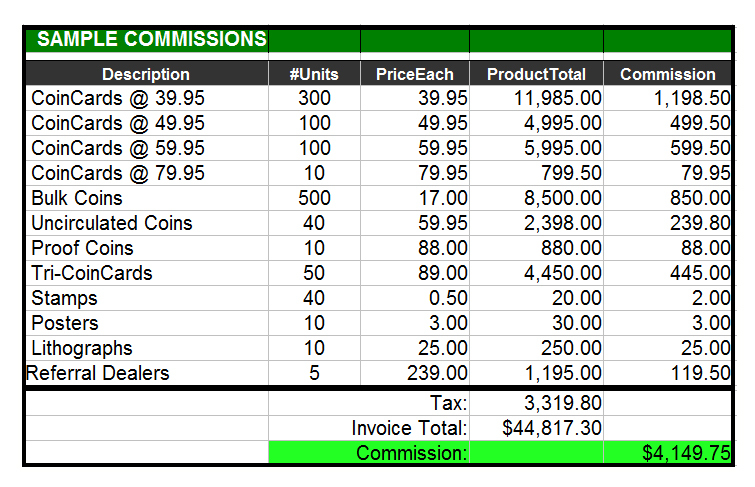 All commissions are paid weekly. Includes Sales Materials and a CoinCard. Independent Dealer Agreement subject to Acceptance or Rejection.